Lowdown: A zombie uprising with plenty of money for special effects. I don’t know why the topic of zombie uprisings became so popular lately, but World War Z is yet another exploitation of the theme. And frankly, I was quite unimpressed with its unoriginality. We begin with a typical American family stuck in a traffic jam at downtown Philadelphia. Signs of distress start showing up, then escalate through an explosion, then total chaos with no one knowing what’s going on, and then the world comes to an end through bombastic special effects. Seen this before? Yeah, I know, I watched Independence Day and The Day After Tomorrow too. As well as countless more. So, this time around the cause is a rabies like infection that turns people into zombies – big deal. Our hero for the duration of the war is Gerry (Brad Pitt), a family man that also happens to be some hot shot formerly in the service of the UN. Thus when civilisation dies he is rescued and transported to the seafaring UN fleet’s headquarters (no, such a fleet does not exist in real life). He’s given a task: help find the cause of the virus in order to help find a cure, and in return his family will be allowed to stay with the fleet instead of risk going back to the infected land. Thus Gerry goes to try and save the world. First he goes to North Korea, where rumours say the plague begun; then his findings lead him to Israel, which managed to avoid its own infection thus far. In between highly effects driven action scenes, the plot thickens as the quest for an antidote gains momentum. Let’s clear one thing out of the way: World War Z is, first and foremost, an obviously expensive special effects bonanza kind of an action film. Sure, there are some horror elements involved, but they are not the main event – this is not a “sit quietly till we make you jump” kind of a movie. Clearly, though, World War Z also has some aspirations behind the cheap [expensive] thrill. UN taking over? A plot that moves between hotspots such as North Korea and Israel? There is a message here, and it is obvious. World War Z is trying to tell us we are all sharing this planet and should thus deal together with the real enemies confronting all of us, instead of pettily mongering about silly things and killing one another in the process. I can take that message; I think it earns World War Z a few brownie points over its peers to the genre, even if it loses many other points in the originality front. Obviously, the point World War Z is making is very relevant. Think of what is currently taking place in Syria and the way Israel is handling the situation. Now think what would happen if the real Israel was to act the same way as World War Z’s Israel and let refugees into its borders: think what that might do to Arab-Israeli tensions. But also think why it’s not happening in real life to understand what World War Z is trying to tell us. It’s trying to say the zombies are already here and we are losing the war. Best scenes: I liked Israel’s depiction in the movie. I suspect that what seems to have been shot at Malta was meant to resemble the Old City of Jerusalem, which is actually fairly tiny, but that aside things looked authentic. Anyway, the scene where the noise created by interfaith congregations attracts the zombies certainly appealed to this atheist’s world views. Pretty spectacular special effects, too. Overall: When it comes to these “the world is coming to an end as we follow a family survive”, it’s usually a case of seen one, seen them all. 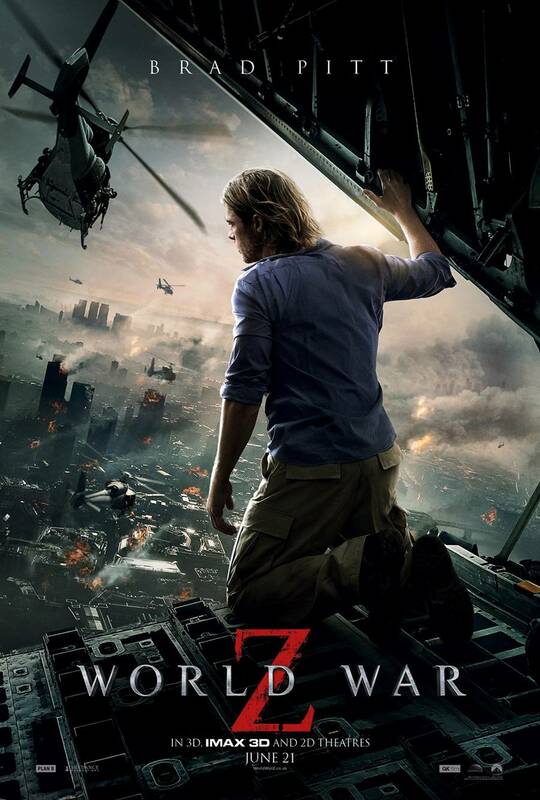 These films can be fun, though; World War Z ups the ante with a worthy message, earning it 3.5 out of 5 stars.